The AdVintage September 2013 wine tour of Tarragona continued with a visit to the De Muller winery in Mas de Valls, just outside of the town of Reus. Founded in 1851 by Don Auguste de Muller and Ruinart de Brimont, the company is famous for its sweet Sacramental (Altar) wines which it supplied to the Vatican under Papal license between 1903 and 1963 and which it still exports to the Catholic Church and its missions worldwide. 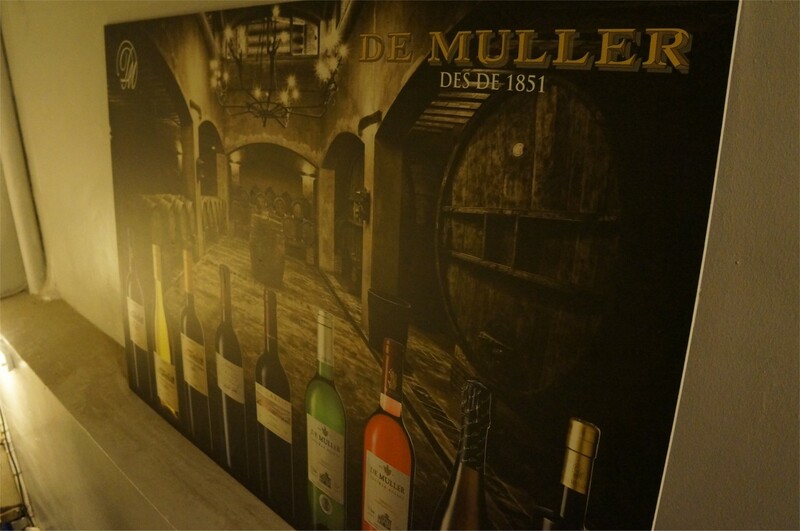 De Muller was bought in 1995 by the Martorell family and expanded in 1999 by the purchase of the Cochs Vermouth company, known locally for their “Vermut Iris”. The estate currently has 240ha of vineyards; 200 ha around the main winery in Tarragona and 40ha in El Molar, in the southwestern of Priorat. Our first impressions were of the size of the place, several large “hangars” and side-buildings. First we went through to the sweet wine warehouse which had a very intoxicating sherry and caramel smell, passing by three ancient, enormous barrels, each holding 55,000 liters. These are supposed to be the largest barrels in Catalonia; 100 year old, slow-oxidation Soleras (Asoleado) giving a hint at the scale of wine-making we were about to encounter. Then the winemaker, Jordi Benito Prades, appeared to take over tour-guide duties. We felt quite privileged having him show us round, although at first he appeared rushed (probably understandable, considering we were right in the middle of the harvest). 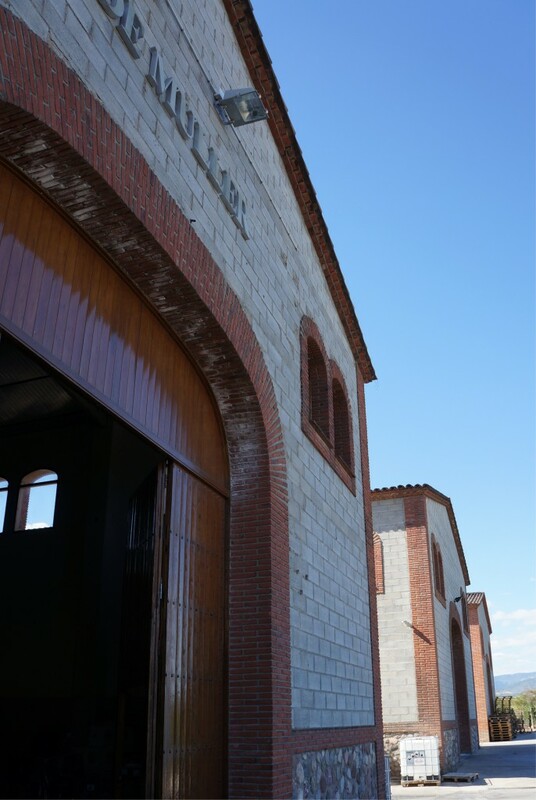 We were ushered through to one of the main winery buildings along with talks on sweet grapes, sweet wines and an overview of the company. Jordi said that they used to supply a cool fermented Sauvignon Blanc to the U.K. through Morrisons, but no longer export to our shores (supermarket pricing didn’t seem a popular topic!). In total De Muller produces 500,000 hl of Sacremental wine for export around the world, along with 200,000hl of sweet wines and 45 other different types of wine, mainly still but including some Cava – we are talking a truly industrial scale of winemaking, the exact polar opposite of what we encountered as Mas Vicenç. We passed by a bottling line where the end result were 1.5l plastic bottles packed into cardboard cases of 6. There were strange looks exchanged until Jordi said this was the Vermouth (Vermut Iris), a popular product to many restaurants which use it as a welcome drink – this was truly bulk recipe wine-making, taking only one month to make and including addition of sugar & caramel for flavouring/colour. 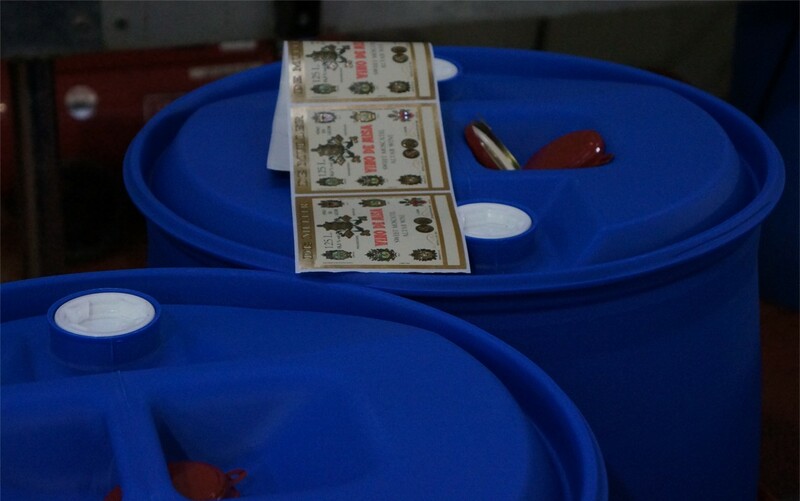 Next door we spied dozens of blue plastic tubs containing gallons of Sacramental wines destined for export to, amongst other places, Ghana and Vietnam – to the relief of thirsty missionaries around the world! 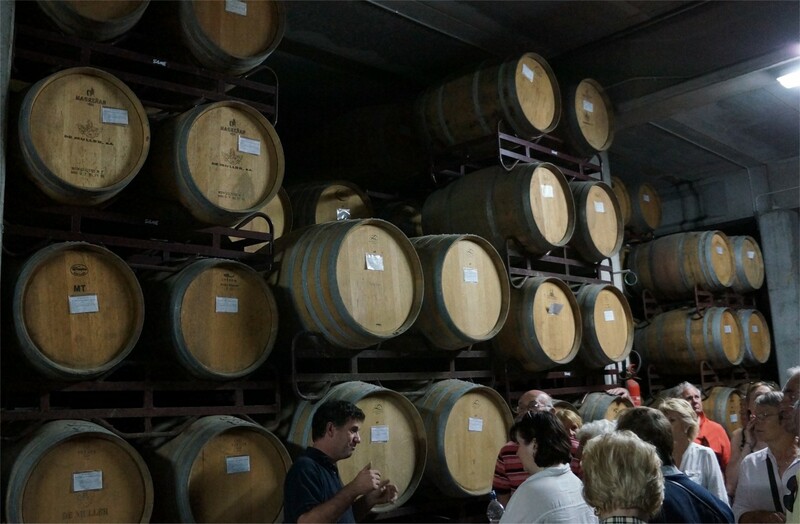 Then we went down into the cellars – past dozens of barrels of different sizes – into the pressing and pumping room. 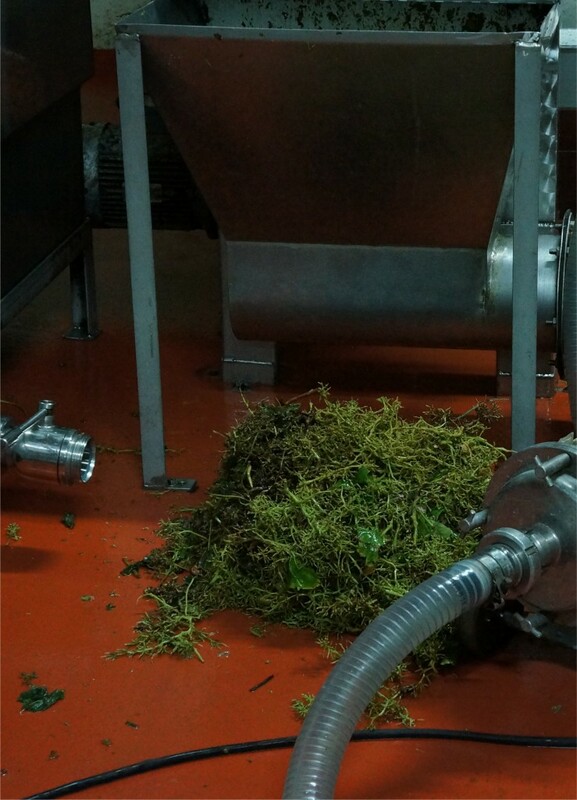 In one corner were a pile of stalks which were the sorry remnants of a whole trailer full of grapes we’d just seen offloaded into the vats upstairs. The pump/press itself looked like a massive jet-engine and towards the back of the room were several rows of new barriques where the barrel-fermenting Chardonnay was resting. Back through to a different room, again stacked high with dozens of barrels from Bulgaria, Hungary, Russia, France etc. By this time Jordi had slowed down and told us of the experimentation they carry out with the different oak, each one chosen for the different flavour components they impart; coffee, chocolate, vanilla etc. His enthusiasm was now showing through and he told of his winemaking family background and spending a year studying in the U.S. This was in stark contrast to the mechanical, industrial operation we’d seen upstairs; down here, amongst the walls of oak, his creative side was apparent. Conversation briefly turned to the 2013 harvest and Jordi admitted he hasn’t got high hopes – the grapes were ripening on average 20 days slower than usual following the cool Spring. On the way to the tasting room we walked past the Cava enclave, sadly locked (with no sign of the key!) containing hundreds of bottles on their sides. 2012 Muscat. D.O Tarragona. 11.5%, €4.50. Very dry with that grapey, fresh Muscat nose. The grapes were early picked (mid-September, compared to mid-October for the sweet wines). Some light melon aromas but a quick finish. 2012 Chardonnay. D.O. Tarragona. 13%, €6. Barrel fermented in new American, German, French, Slovakian, Hungarian & Russian oak (!). 80,000 bottles of the Chardonnay are made and it sells out within the year, with 25% heading to Japan! This wine impressed with a beautiful nose of baked apple and fresh fruit – peach and pineapple. Creamy/buttery on the palate but dry at the edges with coconut on the mid-palate and through to the long finish. 2012 Syrah. D.O. Tarragona. 13.5%, €5.50. Young fruit aged for a short time in Navarran and Bulgarian oak. This had young, dark flavours, was medium-bodied with chocolate and some savoury spice/pepper. Smooth and easy drinking it was a little harsh at the edges and dried up towards the end, but again good for the price. 2009 Les Pusses. D.O.Q. Priorat. 13.5%, €13. An equal Merlot-Shiraz blend aged for 12 months in new Hungarian oak. The label is a map of the vineyard and winery.This had a smoky nose, some coffee with a slightly metallic, green vegetal aspect. Green tannins at the front suggesting an overly youthful wine needing more time. There’s a dry, chocolatey component and a metallic tang on the finish. Then to the sweets and the famous Sacremental wine Vino de Misa, Dulce Superior, Vino de Licor. 15% (Maccabeo & Grenache Blanc). Sweet toffee and a simple grape-fruit component. Pleasing in a salacious way, no complexity but no complaints (I can understand the Papal approval!). A bargain at €4 for a 750ml bottle. Moscatel Añejo, Vino de Licor. 15%. Muscat of Alexandria aged in French oak. Even more of a bargain at €5 since this had some character as well. Lots of Raisins, luscious sweet and long. Several bottles of this were bought by the group and consumed over the rest of the week after the hotel dinners in the evening! We strolled back outside under the late-afternoon Catalonian sun, more than satisfied at a thoroughly enjoyable tour. Again it was hard not to compare and contrast to Mas Vicenç; one artisan, the other industrial, both sides of making wine in Tarragona. De Muller S.A. Camí pedra estela n34, 43205 Reus, (D.O. Tarragona). 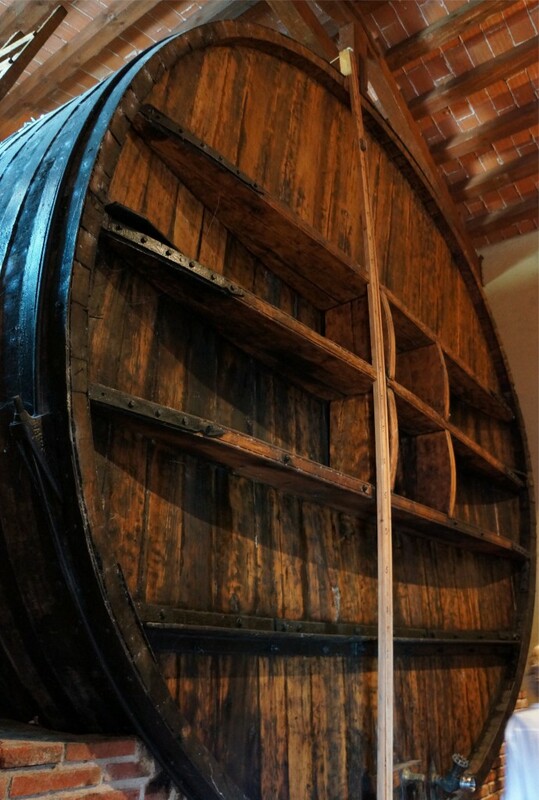 This entry was posted in In Vino Veritas, Wine Producers and tagged AdVintage, Catalonia, Spain, Tarragona. Bookmark the permalink.